"I don’ t want locomotionary substitution, or remote intransitory convolution, only one precise solution is the key….substitutiary locomotion it must me! " 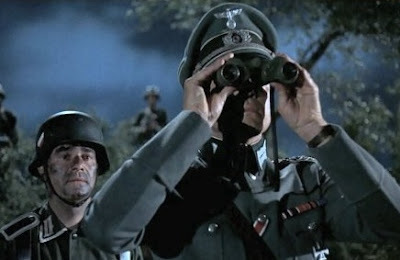 Yes, Eglantine Price was searching, not for locomotionary substitution, nor for remote in transitory convolution, but for that secret magical spell – Subsitutiary Locotion – that would be the key to single-handedly quenching the onslaught of the Nazis and putting a stop to the war! In her secluded country estate in the cover of night, mild-mannered apprentice witch Miss Price, along with her scraggly looking cat Cosmic Creepers, practiced her latest lessons from Professor Emelius Brown’s Correspondence College of Witchcraft. However, when three evacuee children from London take lodging in her home, her top-top secret identity is discovered and as an exchange for their silence she gives them a special Travelling Spell. "The game’s up Miss Price, we know what you are"
A bedknob ( and its matching bed ) become the initiators of this fantastic spell, and it’s put to good use quickly when Miss Price and the children set out for London to enlist the aid of Professor Brown in searching for the all-important magic words of Substitutiary Locomotion. Their quest takes them to Portobello Road, the street where the riches of Ages are stowed, where they meet the wily Bookman ( Sam Jaffe ), another Substitutiary Locomotion spell-hunter and his knife-wielding henchman Swinburne; to the Beautiful Briny Sea where they have a chance to get a better peep at the plants and creatures of the deep; and to the not-so-mythical animated Isle of Namboombo, a land of talking animals where the legendary magician Astoroth ( the spell’s creator ) was believed to have spent his final days. Aha….but do they find the magic words to Subtitutiary Locomotion AND put it to use before the approaching Nazis invade Pepperinge Eye and the coast of England? Well, this being a Walt Disney movie, I’m sure we all know the answer to that question. 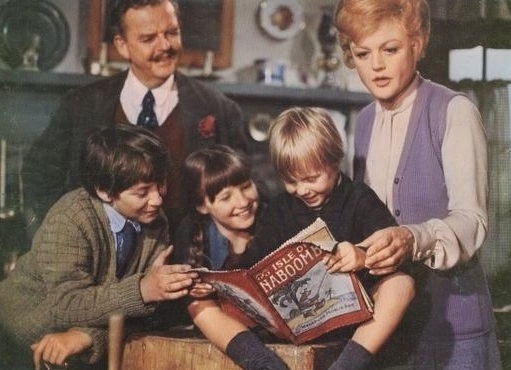 "Bedknobs and Broomsticks" was based on two books written by childrens author Mary Norton in the mid-1940s. " The Magic Bedknob, or How to be a Witch in Ten Easy Lessons" and its sequel "Bonfires and Broomsticks" were originally purchased by walt Disney in 1963 as a back-up plan in case P.L Travers did not like the retelling of her story Mary Poppins, a movie which was already in its pre-production stages at the time. Since Mary Poppins got the go ahead, Bedknobs and Broomsticks was put the back-burner and it was not until 1969 that Bill Walsh blew the dust of the kettle and got it boiling again. Initially Julie Andrews was offered the part of Eglantine Price ( along with Leslie Caron, and Lynn Redgrave ) but had turned down the role. She later changed her mind, feeling she owed her start to Disney and wanted to work at the Studios again, but by this time Angela Lansbury had already been offered the role and accepted …signing the contract on Halloween Day of 1969. And what a great choice she was! Miss Lansbury played Eglantine, the apprentice witch, with conviction and heart. 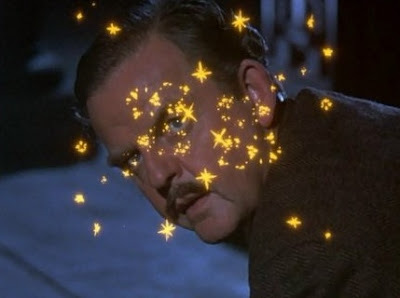 And the wonderful David Tomlinson ( Mr.Banks of "Mary Poppins" ) played penny-any magician Professor Emelius Browne, a role he took to with a flair. Mr. Browne : Bookman! Before your very eyes, I shall cause this bed, and all the occupants upon it, to disappear! ﻿Bookman : Disappear? I should like to see a cheap-jack tenth-rate entertainer do a trick like that. Mr. Browne : Cheap-jack entertainer. Now that was naughty. 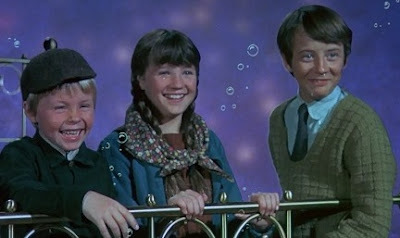 The three children ( Ian Weighall, Roy Snart, Cindy O’Callaghan ) were all making their screen debuts and save for Cindy O’Callaghan, have not done any other film work since then. A pity, because they were very good child actors. 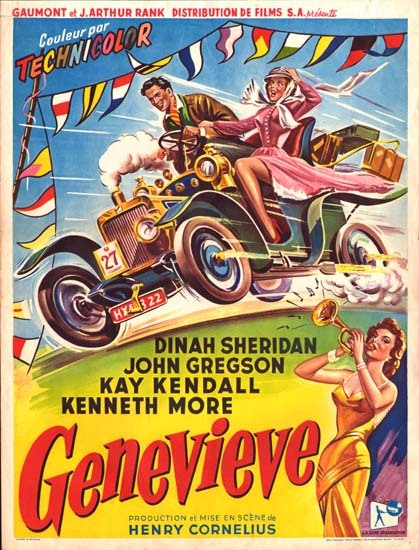 Roddy McDowall played Mr.Jenks, a priest with an eye for Miss Price ( or rather, her valuable bit of property ); Reginald Owen was…well, Reginald Owen….mouth wide-agape and commandeering the soldiers of the Old Home Guard; Tessie O’Shea played shopkeeper, town gossip and postmistress Mrs. Hobday, and rounding out the cast was John Erikson, as the Nazi captain who has a bad fall-in with some headless fighting armor. Bedknobs and Broomsticks is a heartwarming and bewitchingly enchanting movie and like most Walt Disney films, the supercalifragilistic Sherman brothers song-writing team had a big part in contributing to this. 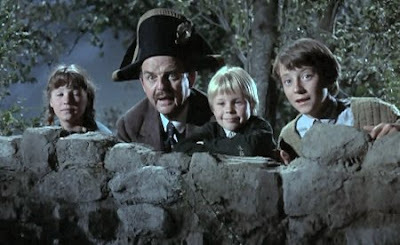 "Bedknobs" is chock full of wonderful whistlable tunes like "The Beautiful Briny Sea", "Portobello Road" and "Eglantine, Eglantine!" 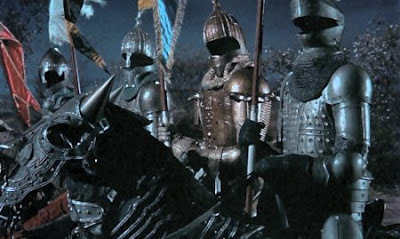 and BEST of them all is the lovely "The Age of Not Believing" ( nominated for an Academy Award ). It’s words brilliantly capture that period in life that we all go through at times, when we doubt our own abilities and lose faith in our dreams. Miss Price wasn’t a very capable witch, even for an amateur. She couldn’t fly a broom straight, nor turn a person into a frog ( although she did have a knack for morphing them into fluffy white rabbits ) but she had a heart of gold and tried the best she could to save her beloved England. Technically, a witch is a lady unless circumstances dictate otherwise, and at the closing we see this clearly demonstrated in Eglantine as she dons her battle helmet and pulls out all the stops to fight the Nazis had on. 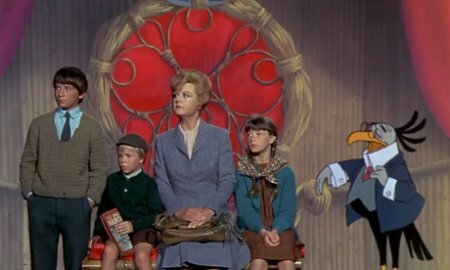 "Bedknobs and Broomsticks" premiered in 1971 at Radio City Music Hall as part of their Christmas show, but unfortunately over thirty minutes of this wonderful movie had to be cut to fit into its two hour time slot. And for some reason this sliced footage was left out of all the subsequent national showings as well. It was not until 1997, for the 25 th anniversary vido edition, that most of this deleted footage was reinstated. It's still missing a few key scenes, but we'll not complain, after all it's a step in the right direction. Oh, bother! I do hate shoddy work!